I don't do many product or book reviews on my blog. There are enough sites that do reviews that I can leave it to them. Everyone has their own taste when it comes to cookbooks or kitchen utensils. I occasionally read reviews or recommendations on these types of products, but typically follow my instincts when deciding if I want to purchase a particular item. 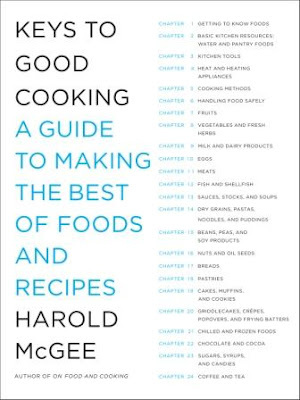 But when I was asked to review Keys to Good Cooking: A Guide to Making the Best of Foods and Recipes by Harold McGee, I knew that it was an indispensable cooking reference guide that would be a welcome addition to any kitchen. Some reference books are overwhelming, hard to read, so heavy that you need a forklift to carry them, and basically boring. Even with a whopping 553 pages, Keys to Good Cooking is easy to navigate and gives concise tips on kitchen topics ranging from cooking methods, getting to know your foods, and handling food safely. Every possible food is discussed from eggs to meats to vegetables to grains to breads to chocolate. It seems every cooking question one could have is answered in a straightforward manner by giving enough information in a succinct manner. Undertaking the writing of a book of this nature seems like a daunting task. But author Harold McGee has presented the material in such an easy going way that I found myself flipping through page and page and dog-earring several sections of useful information. Typically, I place my pizza from the oven directly on a cutting board to cool resulting in a soft and slightly soggy crust. From the information I learned about keeping pizza crusts as crisp as possible, I discovered that transferring them from the oven to a cooling rack and then cutting them with kitchen shears will keep the crust crispier as crusts quickly soften when place hot against a cutting board that traps steam. This advice seems simple enough, but it never occurred to me to cool my pizza on a cooling rack. If you are a seasoned cook or just starting out in the kitchen, Keys to Good Cooking would be an essential kitchen reference guide. Disclosure: I was sent a free copy of this book to review. All opinions are mine, and I was not compensated for writing this post. I will see if i can borrow this book from my library. Thanks for the review, i am definitely interested to see it for myself. That is a good tip! I will have to check out this cook book. This really does seem like an essential item for every kitchen. Thanks for your review! Sounds like this would be a good gift for many new or seasoned cooks. Great review! I am always a little skeptical of kitchen reference books. Who would want to read one? But this one is easy to use and read.